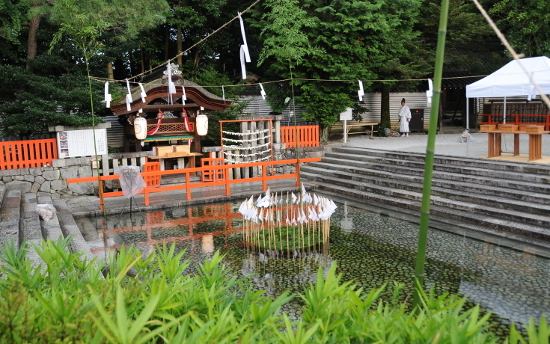 Last weekend, there was a very interesting summer purification rite at Shimogamo Shrine. This time, we random spectators were not allowed to participate, but it did involve the Mitarashi Pond at the Shrine again. When I arrived in the early evening, there was a circle of arrows stuck into the pond, and some fire places were set up and a table for a prayer ceremony. Eventually, two priests came to pray in front of the little shrine you see in the back of the above photo, and when it became dark, the fires around the pond were lit. There was quite a bit of waiting, but when it was really dark, two groups of men arrived together with a number of priests. The men took their seats on the steps leading down to the pond on both sides, and there was more praying and a blessing of both groups. When this was done, a sign was given, and all of a sudden, both groups jumped up and into the water and tried to get as many of the arrows as possible. 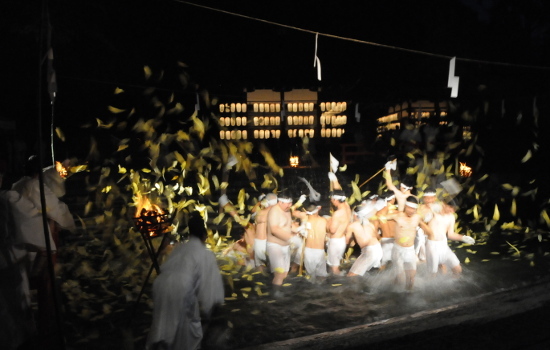 While they were splashing about, the priests were throwing yellow pieces of paper into the water and onto the participants.Everything was over in two or three minutes when there were no more arrows to be grabbed. The participants, now all wet, sat down again for another blessing, and then left quickly, and the whole ceremony was over. This ceremony is meant to pray for health for the rest of the year, and getting one of those arrows is meant to be extra lucky. I could not find out what was happening after the official ceremony, and what purpose the arrows have, but I guess they will be put in the houses of the participants who won them. However, the yellow paper was in the shape of humans, and on each piece was written a name and the wish of that person for the rest of the year. Those paper dolls were fished out of the water rather unceremoniously in the end, I guess they were thrown away or maybe burnt afterwards. The most interesting part of the ceremony was that there was one woman amongst all the guys competing for the arrows. Never before have I seen women participate in this sort of religious events (other than as helpers somehow), so I don’t know if this was an exception or common at Shimogamo. Maybe Japan is changing after all? This entry was posted in All Things Japanese, Kyoto Special, religious ceremonies by Iris. Bookmark the permalink.